With the Halsey sectional, fresh contemporary styling meets irresistible easy care fabrics in two warm shades of brown. Suede-soft microfiber cushions and seating with attached durable leather like brown vinyl creating a sharp contrast. 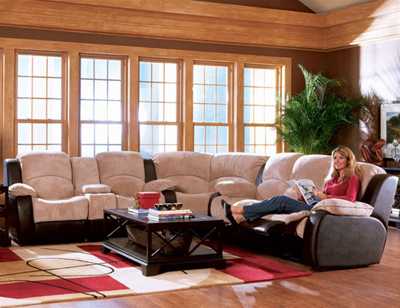 With a sleek scoop seating and 4 recliners this is sure to be the best seat in the house. Sectional with a two tone cover combination. Sleeper comes with inter spring mattress. Also available occasional tables. Occasional group in a cappuccino finish with "X" design sides. Features storage shelf.